The City of Vicenza and the Palladian Villas of the Veneto represent the Palladian style in architecture, which became influential all over Europe and the United States. 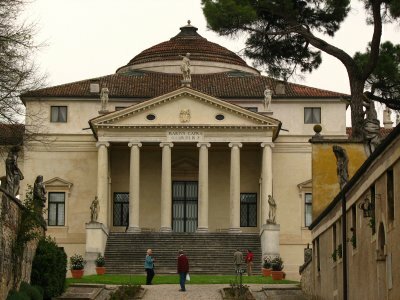 Andrea Palladio was educated as a stonecutter. After studying classical architecture in Rome, he developed the style named after him. In Palladianism, a villa has a dominant central focal element flanked by lower servant wings. It is strongly inspired by classical Roman principles. 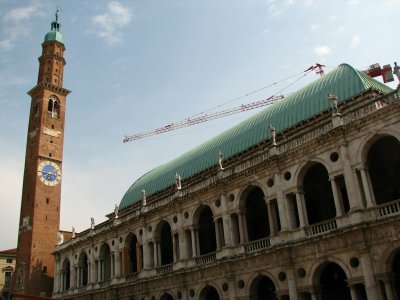 In Vicenza and its outskirts, 26 monuments are designated. The site was extended in 1995 to include 21 rural villas in the wider Veneto region, also designed by Palladio. They can be divided into working villa-farms and summer residences. Vicenza seems to be just another Italian town with a historic city center. Its main street, the Corso Andrea Palladio, is named after its most famous citizen: the architect Palladio. In this street there are already some of his palazzi. More grand is the Piazza dei Signori, the town’s central square. There’s a huge Basilica, a strange classical building which was meant as a meeting place and is now quite derelict. On the opposite side is the fascinating Loggia del Capitano that has many sculptures. At the far end of the town is an inconspicuous sight at first, but a real treat: the Teatro Olimpico. This was the last building planned by Palladio, however he died a few months after construction had started in 1580. Vincenzo Scamozzi finished this work that was aimed to fulfill the humanistic and artistic needs of the intellectuals of that time. The stage is a real masterpiece, you're just waiting for the moment that some ancient Roman actors will show up and start the play. It had started to rain a little when I went on my way to visit ‘La Rotonda’, one of Palladio’s masterpieces just outside town. There’s a foot- and bike path that leads you there, a pleasant walk when the weather is fine enough. First you pass the elegant Villa Valmarana ai Nani. The second turn to the right is the way up to La Rotonda. It was already noon, so I knew then that I wasn’t going to make it: the gardens have very limited opening hours (the interior even more so). Unfortunately I wasn't allowed more than a glimpse from the front gate. 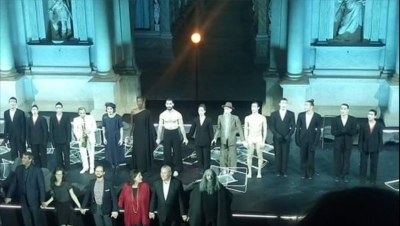 I had visited Palladian Vicenza before but went back there on the occasion of the Robert Wilson production of Oedipus by Sophocles at the Teatro Olimpico, originally designed by Palladio. Known as the oldest surviving indoor theater in the world, the Teatro opened with Oedipus in 1585, which makes this the 433 anniversary production. Why 433 anniversary? I don't know. Teatro Olimpico is basically a Greek amphitheater enclosed in a Renaissance building. Its most distinguished feature is the seven streets that extend into the back and the sides of the stage. They were originally created for the first production of Oedipus in mind and were supposed to represent the streets of Thebes, Greece, where Oedipus is set. It was such a pleasure to see a Wilson production on a World Heritage stage. To think about it, a few years ago Wilson gave a Peter Stern lecture on his aesthetics at the World Monuments Fund, the organization that does the real restoration of world's monuments. Palladio's influence on American colonial architecture can be seen in historic homes and structures throughout the East Coast of the United States, including Thomas Jefferson's Monticello and the University of Virginia. For that reason, I made certain to include the City of Vicenza and the Palladian Villas of the Veneto in my travel plans when I visited Italy last fall. 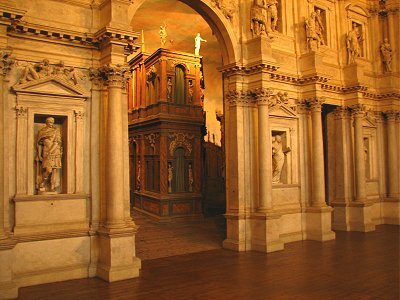 Vicenza is a pleasant city not far from Venice and Padova, and it is packed with examples of Palladian architecture, including the Palazzo Chiericati, the Basilica Palladiana, and the Teatro Olimpico. While the loggia of the Basilica Palladiana was wonderful to see, it was somewhat obscured by tents for a chocolate fair on the day I visited; the Palazzo Chiericati was much more accessible and just as impressive. Nearby, the intricate stage of the Teatro Olimpico was worth the wait to visit. In the afternoon, I continued by bus to the famed Villa Almerico Capra, or "La Rotunda", which inspired Jefferson's Monticello. I made sure to visit on a Saturday so I could view the interior, but unfortunately photography was not allowed inside. The building was magnificent, however, and I spent a good hour admiring the grounds. For anyone with an interest in architecture, I highly recommend Vicenza. Logistics: Vicenza is accessible by train to many nearby cities, and the downtown is a short walk from the train station; both a bus and a foot path connect the town with La Rotunda, on the outskirts of town, and I can recommend the foot path. I visited this WHS in June 2012. I never actually stopped to visit the Palladian villas when I used to live in nearby Verona, so this year I wanted to make up for it. I was greatly rewarded as most of the Palladian villas are really well preserved and looked after. The best one to visit IMO is the Rotunda although the entrance ticket is quite expensive. 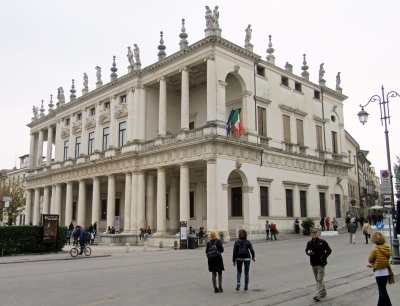 The historic centre of Vicenza has a lot of Palladio works to offer too. Well worth a visit is the 3-D Teatro Olimpico with a sound and light show taking place every hour. Being a fan of Palladio's architecture I spent several days visiting the listed sites. One day was spent in Vicenza alone visiting the plethora of his buildings along Corso Palladi and its side streets and adjacent piazzas in the Historic Centre. The Palazzo Chiericati, the Loggia del Capitaniato, the Palazzo Porto Braganza and the Palazzo Valmarana Braga epitomised for me the essence of his designs. Because of the restricted opening hours, most of these buildings were viewed from the exterior only. In August this year I finally managed it to visit the last of the Palladian villas on my wish list, the Villa Americo-Capra, named La Rotonda. During several trips to Northern Italy in the last ten years I have visited almost all the Palladian villas that are open to the public. La Rotanda is regarded as one of Palladio's masterpieces and is really amazing. The villa was built on the top of a hill and should certainly demonstrate the power and wealth of its owner. The building is symetrical: it has a cubic form with a round hall and a dome in the centre. There are four vestibules leading to four entrances, each with a loggia with six columns and a staircase. The interior is decorated with paintings and ornaments from the late 16th and the 17th Century. Vicenza is a charming city, though not my favourite town in Northern Italy. The highlight is a visit to the Teatro Olimpico. The construction of the stage impresses by its spatial depth, which is an optical illusion. Across from the theater is the beautiful Palazzo Chiericati (now the City Museum), one of the few Palladian palaces that are open to the public. From here you can stroll along the Corso Palladio, where a lot of the Palladian palaces are located. A must see is the Piazza dei Signori, with the Loggia del Capitanio and the so-called Palladian Basilica. 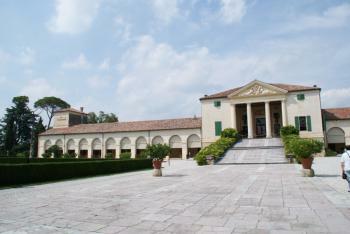 It is not really a basilica, Palladio designed a new front with a double-storey loggia for an existing palace. If you just want to tick off this WHS, it would be enough to visit the city of Vicenza. 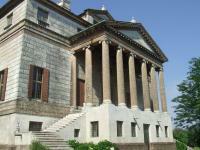 But those who want to get a deeper impression in the work of Palladio should visit at least one of the villas. 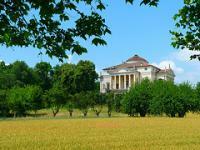 La Rotonda would be perfect, because it is just a short walk from the centre of Vicenza. Unfortunately, the interior of the villa is opened only on Wednesdays. For me, it is unclear why a total of 23 villas have been included in the nomination. 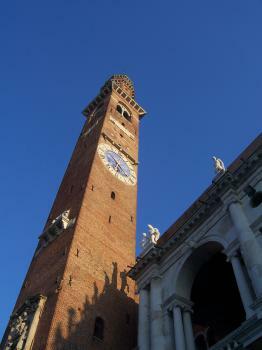 This means that almost all buildings, which are attributed to Palladio, are inscribed. It would have been better to select some typical and outstanding examples. Many of the villas are not open to the public or by special appointment only and some are in urgent need of a restoration. Among those who are regularly open to the public, the Villa Emo (in Fanzolo, 50 km northeast of Vicenza) is my favourite (photo). From the outside it is rather plain, but the interior is beautiful designed and decorated with wonderful frescoes. 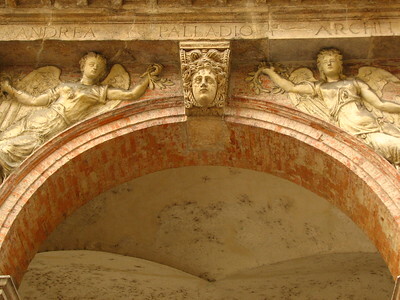 Other villas, which I can recommend for a visit: Villa Barbaro (in Maser, 50 km northeast of Vicenza), not far from Villa Emo and almost as beautiful, Villa Foscari/La Malcotenta (in Mira, near Venice) with frescoes inspired by Ovid's Metamorphoses, Villa Godi-Maliverni (30 km north of Vicenza), his first project, and Villa Badoer (near Ferrara). Alas I missed the chance to see the interior of any of the famous Palladian villas as many are not open in winter, however I did enjoy my last afternoon in the Veneto wandering around the charming centre of this city. The works of Palladio and his students are to be seen everywhere in the city centre and the Tourist information office has produced a nice little map that makes them all very recognisable. I was impressed by the Basilica Palladiana, which was undergoing some extensive restoration when I visited. The function of the building seemed a little lacking as it mostly contained some derelict looking shops however its bulk was impressive. The many other fine buildings designed by him in the centre were well highlighted and it was nice strolling inside a few of their entrances and courtyards, where you can really get a sense of the proportions that Palladio was famous for. I was disappointed that I wasn't able to see the la Routunda which is perhaps one of the most influential buildings ever constructed, however it does not open in winter, this does give me a great reason to return though. Palladio is perhaps one of the most influential architects in history, and this cluster of his major works is certainly worthy of a place on the list. Vicenza was a nice town, trying hard to make the most of the assets it has whilst being overshadowed by many of its more famous neighbours. However I would certainly say it was well worth a full afternoon, and I would happily go back to explore some of the villas in the surrounding countryside. The town of Palladio, Vicenza, to this day bears witness to the architectural feats of its most famous resident. From the immense Basilica that dominates the Palazzo dei Signori to the perfect geometry of the villa, La Rotonda, that watches over the town from afar, Palladio's genius is everywhere on display. Of particular note are the Teatro Olimpico, which Palladio designed but died before completing, and the street, Contra Porti, along which many of his finest palazzi reside. Vicenza is a short hop from Venice and Padua, certainly worth a day if you have it in your schedule and a must for you architecture buffs. 2.5: Solivagant Gary Arndt Els Slots Ian Cade Shijie ZHU Daniel Chazad Antonio J. Damaged in World War II: Villa Valmarana in Lisiera. The villa was nearly totally destroyed during World War II, but has been rebuilt.